The Commercial Relocation Network takes the necessary innovative steps to assure that we keep your company’s green initiatives in mind. We will help your company to reduce waste, recycle materials and lighten your carbon footprint, in a safe and legal and manner. Being green is not only better for the environment, but can also save your company thousands of dollars. As leaders in the industry, you can count on us for all of your recycling needs. CRN focuses on computer moving, fine art and electronics moving, library moves, commercial office moves, and so much more. All different types of moves often involve getting rid of old, unnecessary items. We make it easy for you to get to your new location without having to haul along pointless junk or outdated files. We can dispose of any unwanted materials that surface, before and during the moving process, from large furniture, to computers. 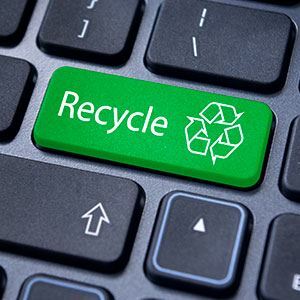 Our e-waste disposal is certified as a green method, because at CRN we care about the environment as much as we care about helping you move quickly and soundly. We also take care of destroying secure documents, so you can clean out old paperwork that isn’t needed any more. Whatever you want to get rid of, CRN easily does it for you so that your new workspace will be clutter-free.